A single form of tax applied for a particular good or service, that is implemented by the Central Government is the Goods and Services Tax (GST). It was enforced in 2017 for which the government has been pushing for since 2006, and it is known to be one of the biggest reforms in the Indian economical history. The GST was enforced in every sector, including the insurance sector. GST completely abolishes the cascading effect of multiple taxes that were levied on a good or service, prior to the implication of GST. GST has not only simplified the tax system, but it has replaced 17 state and federal taxes. Although there are a lot of positive outcomes of GST, it has definitely impacted a common man’s lifestyle and the expenses in our daily lives. From purchasing a toothpaste to buying a car, making an investment or even securing our lives with an insurance plan, in each and every aspect of life, GST plays a major role. As said above, GST has replaced all the taxes that were levied by the central and state government such as VAT, service tax, excise duty, entertainment tax, luxury tax, etc. All these taxes are simplified into one single tax with two components namely, State GST and Central GST. For example, on a particular service if you are paying a GST of 10%, the state GST will be 5% and the central GST will also be 5%. Therefore, for any goods you buy or any service that you obtain, you will have one tax amount which is comparatively lesser than before. As per the rule recently implemented by the Central Government of India, the service tax payment is optional, if it is levied by any restaurants or hotels or any other place. Although the cost of goods have reduced in most sectors, the service cost has increased. However, it has mostly reduced the pressure on the consumers regarding the same. Before GST, the tax on motor insurance was 15% which included basic service tax, Krishi Kalyan and Swachh Bharat cess. However, after GST the tax payable is 18% which is 3% higher than before. Therefore, the customer will pay a higher premium amount towards a motor insurance policy. If a customer buys a third-party policy, which is the basic statutory requirement by the law, the actual premium that he/she pays towards the policy is less. However, if a person buys a comprehensive policy, the actual premium is higher due to the coverage capacity and hence, affording to buy a comprehensive policy for a working class individual will prove to be much expensive than before. In the case of third-party premium, the effect of GST is comparatively lesser as the premium amount is lower. Motor insurance falls under the general insurance category, the same will be applied to other types of insurance in this bracket. The IRDAI is struggling to get two-wheeler riders to have at least third-party coverage, because more than 60% of the vehicles are not insured. One of the reasons that is often cited by the vehicle owners in many studies conducted by various insurance companies, is the increased tax rate. Although this issue is a growing concern amongst the government, IRDAI, and insurers, riding two-wheelers or any other motor vehicle without a valid insurance policy is non-excusable and is considered as a punishable offence. Any vehicle owner riding without a motor insurance policy will be penalised and the registration of the vehicle will be cancelled until the owner insures the vehicle. The increase in tax percentage has definitely increased competition amongst the insurers. This in turn has increased the offers, discounts, and added benefits to a potential policy buyer by the insurance companies. 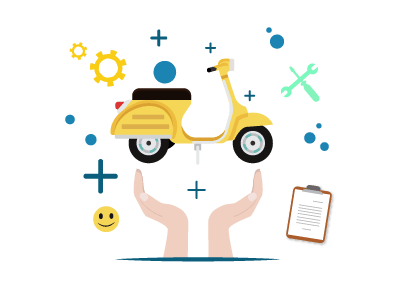 However, it is important for a potential buyer to understand that premiums or policy pricing should not be the only criteria to purchase a two-wheeler or any other motor insurance policy. The coverage offered, benefits, network of garages, discounts, additional covers, etc. have to be considered before buying a bike insurance policy. The effect of GST has tightened the competition amongst the insurance companies, hence the quality of service, digital facility offered, door step service, etc. have resulted in a domino effect. If the policyholder wants to pay the insurance premium in installments, please know that the GST of 18% is applicable on the entire premium. Due to uncertainties that may arise while riding, having a proper two wheeler insurance policy which will safeguard your life. There have been several campaigns conducted by the IRDAI, to spread the awareness about insuring your vehicle, which in turn, insures your life. Although there has been a hike in GST on bike insurance premiums, there are several insurers who offer great deals on vehicle insurance policies. If you are purchasing only a third-party liability policy, no discount will be offered by the insurer. However, on a comprehensive policy, a number of discounts like NCB, loyalty discount, etc. can be availed along with upgrading the policy with additional cover options like NCB cover, nil depreciation cover, personal accident cover, etc.